John Addison Birkbeck of the Rathalpine Press, Dundee, collected printing equipment and books and records to do with the printing trade. When he died in 1971, his widow and son presented to the National Library of Scotland the larger part of his library and some specimens of printing equipment. Our images show some pieces of wood type and a stereotype plate which are part of the Birkbeck Collection. 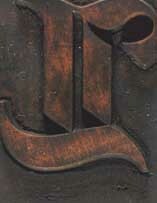 The wood type represents the letters NLS. The sterotype plate is the title page of a children's book called 'A little pretty pocket-book intended for the instruction and amusement of little Master Tommy, and pretty Miss Polly'. The title page is dated 1767, but this plate was made at a later, unknown date. Stereotyping was a method of making plates of whole pages of type. The plates were easy to store for reprinting books at a later date, and this also freed the pieces of type for re-use in other books.